The constructs of emotional intelligence (EQ) occupy a lot of my thinking time lately. I’ve been studying the discipline and trying to take it from academics to practical applications in my own life, my leadership style and my coaching practice. One of the key learnings for me has been that EQ is focused on how we experience our relationships with others. There are many dimensions of EQ, but they all tend to roll up to our strategies for managing our relationships. 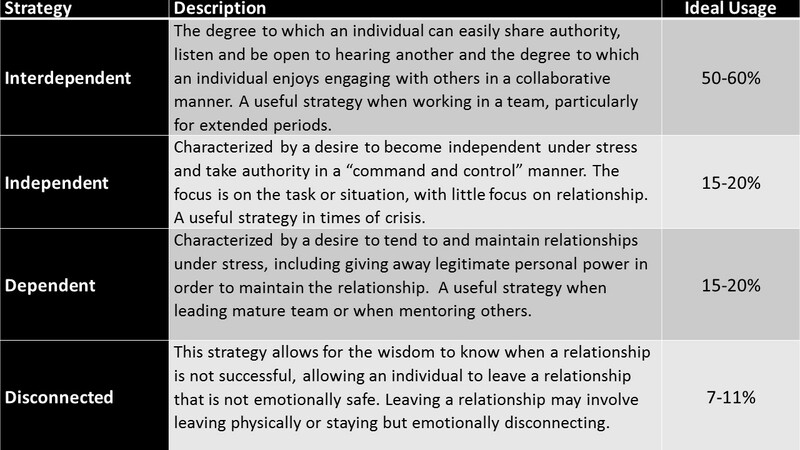 It is generally understood that there are four unique modes for engaging in relationship with others: interdependent, independent, dependent, and disconnected, as described in the table below. I don’t mean this to be a lecture in emotional intelligence but I thought it important to set the stage with a little of the theory that is motivating my thoughts, so one last bit of information. The strategy one employs can also tell something about how we trust. The first two strategies indicate high trust in oneself, whereas the latter two indicate low trust in oneself. Excessive use of independent and disconnected strategies can indicate low trust in others. How can we use this information to increase our level of engagement, enjoyment and effectiveness? If you sit quietly and think about yourself as part of relationships (teams, couple, friendships, one-on-one encounters, etc.) what tendencies do you notice about yourself? Are you a collaborator that is most satisfied when working or thinking something through with someone else? Or do you tend to want to process things on your own? Do you want to be in control or is it better when you let go of control to others? How do decisions get made … do you tend to want to jump in and “make it happen” or are you content to allow discussion to continue? When and how do you check out of relationships? How often? Interdependent – a real people first strategy, high interdependence will mean high collaboration, but there may be a tendency to search for consensus too long. Leaders who do this are at risk of creating an emotionally demanding space for their teams. Those with lower dependence on this strategy are those who may work best in situations with clearly defined authority and expectations of them. Independent – the gift of this strategy is the ability to get things done even when there is resistance, although overuse may lead to the “not a team player” tag. Leaders who rely heavily on this strategy may create dependencies in their team, where members cannot spread their wings and learn. This is a strategy typical of entrepreneurs. Dependent – the gift of this strategy is the value one places on relationships. Keeping relationships becomes the focus, not getting things done. It allows team members to develop their capabilities as they are given the authority. When used excessively, we may tend to give away our power to others in order to maintain the relationship. An example of this might be in sales people where the customer relationship becomes more important than their own company’s profitability. Disconnected – using this strategy appropriately allows us to establish healthy boundaries in our relationships, knowing when to disengage for our own well-being and for the health of our relationships. If we use this strategy too much, we may find ourselves leaving interpersonal situations before we provide or receive full value. Too little of this strategy may have us appear too tenacious. Does that help give you an idea of how you tend to engage in relationships? Can you see where there are strengths for you and perhaps blind spots as well? How can you use this knowledge to enhance your relationship experience? For instance, if you know that you have a tendency to retain control and want to make decisions, can you prepare for a meeting by making a list of questions that you want to ask, and try to stay in listening and questioning mode for much of the meeting. Ask the team to make their recommendations before you move into decision making mode. How could you use this knowledge to benefit a one-on-one relationship? What if we were to make some informed guesses about the other party’s relationship strategies? For example, if we know someone to be strongly motivated by consensus, and appearing indecisive, could we take an approach of being clear when we are in agreement and thus creating a platform for decision making. If someone we know tends to always allow others to make decisions, can we invite them to share what they know and provide positive feedback so they begin to trust their contributions? Time for “one last bit” of information one last time :-). My post last week was about why we shouldn’t “mess with happy“. This comes into play here as well, as research has shown that the emotion joy plays a key role in our ability to stay in an interdependent relationship. Joy provides us the vital energy required to remain in relationships. The amount of joy we bring into our lives will affect the way we engage in relationships, most importantly in our working lives. Thanks for your thoughts Heather. Enjoy the sea air – I’m jealous! I always appreciate what you add to each week’s discussion Diana! What I love about these strategies is that each does have a purpose and we are inended to use all of them! I too find that the fact each strategy has ‘a gift’ and is necessary in some form is very powerful — it really highlights how in all things, balance is essential. Our greatest strengths can becomes our greatest weakness — using one strategy to the exclusion of others creates imbalance and weaknesses in relationships. It is amazing how strengths can be weaknesses! Thank you for your contribution! This post left me with mixed thoughts because I felt there are times when you know in your heart something is the right thing to do and it is frustrating having to wade through protocol and against others opinions to try to get to a point of consensus that may never happen. By the criteria above I suppose that spells low trust in others and even though I do not think that is a good place to be, sometimes it is the place where one ends up. I think this is an astute observation. The theory suggests that we need to use all four styles, and there will be times in our lives where we choose to decide, choose to let others decide or choose to walk away (physically or figuratively). All are valid – the important part is to try to use them in balance.